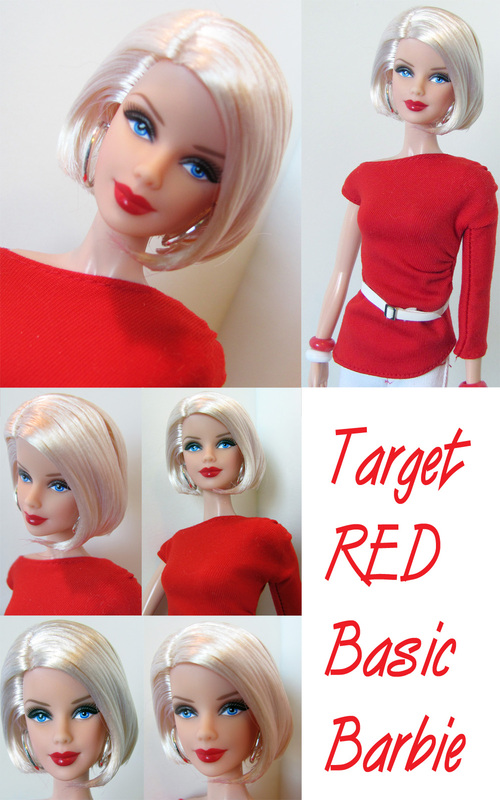 Recently I bought myself another Target Red Basic doll, and this time it was the gorgeous platinum blonde wearing a chin length bob. I had wanted her for awhile, but when she went on sale, I had to have her. So....I bought myself a Mother's Day present. Of course, my dh took me out to a very nice early dinner and then a movie after presenting me with a beautiful card. So....I thought I would take some pics and share them with you here. What do you think? Isn't she gorgeous? I love her, and I look forward to redressing her to give her different looks. Also, I bought myself the Frank Sinatra Barbie at Tuesday Morning, so you might say that I bought myself another Mother's Day gift. tee hee I hadn't really thought I would buy her, but I decided I couldn't pass her up for $19.99. Walmart had her clearance too, but they still wanted $34.97, and I didn't think that was much of a clearance price. Hopefully you will be seeing her soon too, because I plan for her to move in the Barbie house I've been working on. She had a few other girls will be taking up residence there soon. So....stay tuned. I hope you enjoyed this post today. Please leave me a comment. Be sure and play with your dollies or make something pretty. Happy Monday everyone. I meant to stop in yesterday and wish all the mothers out there in blogland a very Happy Mother's Day. I didn't make it. lol Anyway....I hope you all had a great day yesterday no matter if you are the mother of 2 or 4 legged kids. I am the mother of both, and I'm proud of it. That brings me back to today's post. If any of you follow My Froggy Stuff, you know that one project that was shared was how to make a 1:6th scale doll sized cat tree. In case you don't know about My Froggy stuff....she has a blog, Facebook page, and YouTube channel. 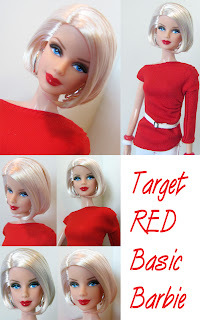 Tons of fun projects to learn how to make for your doll....not to mention inspiration. 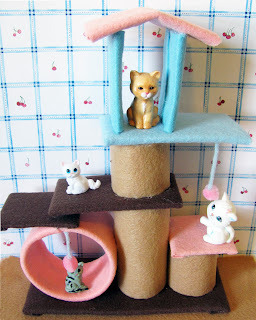 I decided to tackle making a cat tree for my Barbie doll house I've been renovating. BTW.....I'm almost done, so I'll be sharing some new pics soon. I did manage to make a fairly decent cat tree for some of my dolls' cute feline friends, but I did learn a few things along the way. I might make another one in the future to replace this one that I learned on. For one thing, I wish I had figured out to tuck in the small sides of the felt before adhering the sides down. I did at the end, and it made the look turn out to be much neater and more polished. I also used some scrapbooking adhesive, fabric glue, and a glue gun. So...without further blah blah from me, here is my cat tree creation. I think you can see from some of the ends of the platforms what I mean about tucking the ends in first before adhering the longer sides down. The ones I did that on look a lot more finished. Also....I'm not crazy about the top of the room with the peaked roof. Next time I think I'll add a back wall and make the walls a bit shorter. That might keep the room from leaning too much to one side or the other. I have to wait to make another one while using up my shipping tape so I can have another cardboard round tube. lol Getting toilet paper rolls is much easier and faster. haha So...this is my project, and I hope you like it. I'll be sure and share the next one with you when I make it and have a good picture to share. Thanks for stopping by and visiting me. Please feel free to leave a comment. 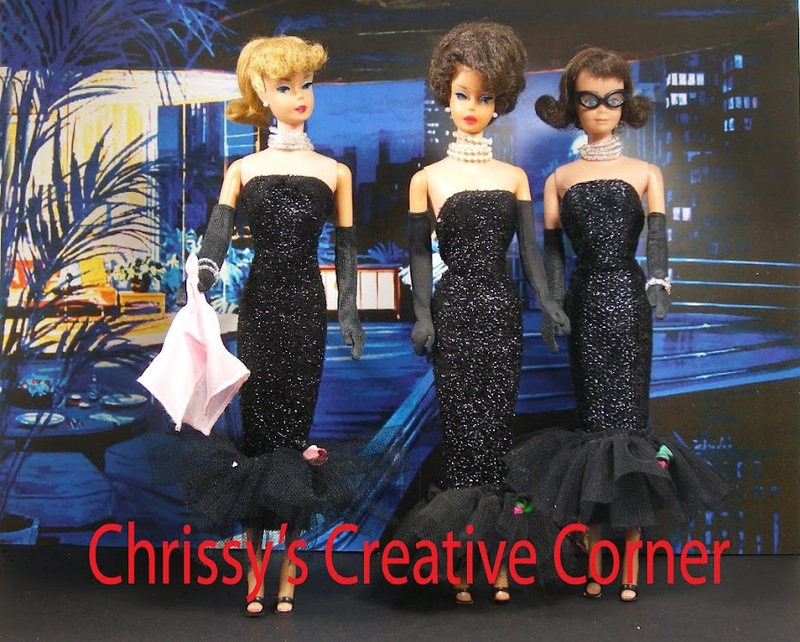 Don't forget to play with your dollies and create something wonderful. Elektra has long beautiful dark hair that frames her gorgeous face. I mainly bought her to redress her, but I still have her original costume/fashion. So....here she is redressed in a fashion that I made myself for a swap a few years ago. Don't you all agree that she is gorgeous. I made this collage with a computer program called Picture It, but sadly...this program does not work on my newer computer. I sure miss being able to use it, because it was easy and amazing what you could do with it. Anyway, here is a closeup up Miss Elektra, so you can see her better. So...until next time, enjoy playing with your dollies or making something pretty.